Goldman Sachs in its recent research paper mentioned raising basic educational achievement as one of the top challenges for India to achieve its 2050 potential. It is heartening to see the private sector stand up and take initiative to raise the literacy levels. I’m talking about the Times of India’s Teach India campaign. 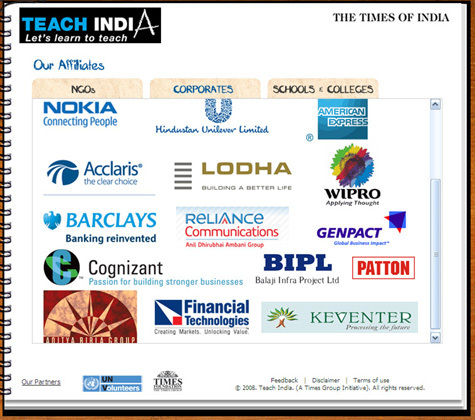 Teach India is a social initiative from the Times of India (Bennett Coleman & Co. Ltd,) that brings together children in need of education and people who can contribute a little time towards teaching them. It already has support of over sixty of India’s committed NGOs, corporates, schools and social organizations. I’ve seen a similar mass literacy campaign initiative (“Arivoli Iyakkam” in Tamil Nadu) by the Government, in the 90s. But this time it is planned and executed by the corporates without any support from the Government. Wish to see more such social initiatives from the Indian corporates without waiting for Government action.